Are you considering starting an affiliate website and not sure how to find a profitable niche? 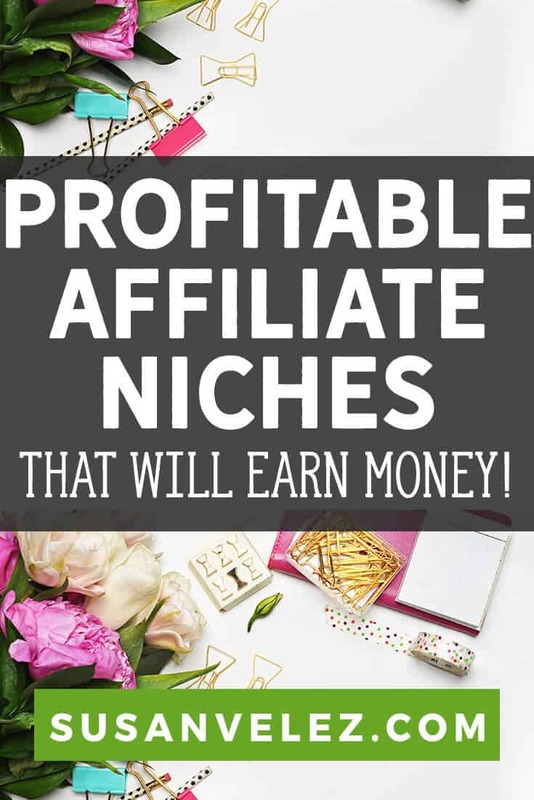 Today, we are going to be looking at 6 affiliate marketing niches and profitable products you can promote. I am a huge fan of affiliate marketing because unlike display ads, you don’t have to have a ton of traffic to make money. If you have the right strategy, you can earn great money without a lot of effort. This training will help you understand what it takes to earn money as an affiliate. When you become an affiliate, your job is to drive traffic to an external website. When that traffic converts into sales, leads or takes some type of action, you get paid. You don’t have to worry about dealing with customer service or creating products. You’re can promote other people’s products and make a great living. Now that you know why I love this monetization method, let’s take a look at how you can find some great niches that you can actually earn from. Choosing the right niche is the most important thing that will determine how fast or if you will even make any money. Most new bloggers tend to choose their blog topic incorrectly, in fact, I’ve made several mistakes in the past. You don’t want to do that, because the wrong niche will make it a lot harder for you to see success. This is why so many people give up before they get results. We’ve been so conditioned to see overnight results. When we don’t see results quickly, we tend to give up and think that this blogging stuff doesn’t work. So most of us will give up and either start a different blog or look for a different way to make money online. What we don’t realize is that success will come as long as we don’t give up way too soon. Now let’s take a look at what you need to consider before choosing a blog topic. Don’t chase the money because it takes a while to see it. I’ve been guilty of starting affiliate websites because I was only interested in the money. Those sites never took off because I wasn’t really interested in them. Find a sub-niche or topic in a popular niche that has less competition. Less known niches have smaller audiences, but it’ll be much easier for a new blogger to see success quicker. Choose an evergreen niche that won’t require you to keep updating your old blog posts. For instance, the tech niche would be extremely challenging, because things change so fast. This means that a blog post you wrote a year ago on the latest laptops, would be out of date. Your blog topic plays a huge part in whether or not you’ll succeed online. Content marketing is hard work and success doesn’t happen overnight, so it’s important to make sure that you choose the right topic that will eventually make you money. Let’s take a look at some of the best affiliate marketing niches that will work for anyone. We’ll also look at some affiliate website examples to help you with your blog. All these niches are evergreen, so you won’t worry about it being out of date in a few years. This niche is huge because, at one point or another, people want to lose weight. The downside is that this is an extremely competitive niche so it’s important to choose a sub niche that doesn’t have a lot of competition. For instance, you could find an angle that targets women aged 35+ and could do very well selling weight loss products. If you’re interested in this niche or any of the niches on this post, you could use a keyword tool like KWFinder , SEMRush, LongTailPro or any other tool to help you find some great sub niches without a lot of competition. I use KWFinder every day in my blogging business and because of this tool, I’ve managed to increase my organic traffic in just a few months, find out how I use KWFinder. It takes time to find a sub-niche that has less competition, but it’s definitely worth your time. I could literally go on to help you find some great topics you can enter in this niche. However, this list is just meant to give you an idea of how to get started. Now let’s take a look at some popular bloggers that started from scratch in the weight loss niche. As an affiliate of this niche, there are tons of different places to find great products, but I highly recommend signing up with some of the most popular networks that can make you money. ShareASale – Affiliate network with tons of weight loss, fitness, and supplement products. Awin – You can find pet supplies and other products to promote. FlexOffers – Tons of different health products and food services you can promote. Amazon Associates – You can promote different types of weight loss and fitness products on your blog/website. Clickbank – Downloadable products such as ebooks and memberships. Now let’s take a look at some bloggers who are upcoming and making a name for themselves in this niche market. https://christinacarlyle.com – is a former nutritionist trainer who now helps women reach their weight loss goals. https://www.losebabyweight.com.au/ – A site established in 2010 and dedicated to helping mums lose weight in a healthy and sustainable way. This is such a popular niche because there are over 500 different dog breeds and several dog behavioral problems with tons of search terms with huge potential. Pet owners are willing to spend money, which means that you can create a lucrative affiliate site in this niche with time. You could narrow this down even further and write content about one specific dog breed like Labradors or Pugs. If you narrow it down to one specific breed, you’d probably see success faster than someone who writes about several different breeds. I know that you probably think you’re boxing yourself in to a very tight niche. But the cool thing is that once your blog starts growing and making money, you can branch out and turn it into an authority site if you decide to. Let’s take a look at some affiliate website examples who started in this niche so you can see what it takes to go from zero to profitable. https://dogstruggles.com/ – this site does a great job on their content and breaks things down according to the type of dog breeds. https://dogfood.guru/ – another site that does a great job on providing suggestions for high-quality dog food products for pet owners. Amazon Associates – You can promote different types of dog products on your blog/website. The “health, wealth, romance, and mindset niche can be lucrative as an affiliate. This niche basically helps people improve themselves, their relationships, or their current situation in life. There are literally tons of different self-help products that you can promote, which should do very well for this audience. Again, instead of just choosing one of these niches, you would want to choose an angle for your website. I’ll cover this more in detail later on, so make sure you keep reading. https://productivitytheory.com/ – A site that was created to help you become more positive and productive. https://www.liveyourtruestory.com/ – A blog dedicated to helping you find your true happiness. Awin – If your angle is the finance niche, you can find tons of products to promote. FlexOffers – Tons of different self-improvement products and financial products to choose from. This is such a lucrative niche, but also has tons of competition. There are tons of different products that you can promote and some have high commissions. The downside to this niche is that it is extremely competitive, so you’ll need to make sure that you take your time to find a sub-niche that doesn’t have a ton of competition. Blogging – you could narrow this down and focus on food bloggers or mom bloggers. The narrower you can go at the beginning, you’ll have a better chance of seeing success quickly. One of the mistakes I made with this blog is NOT choosing a specific niche right out of the gate. Thank goodness I enjoy writing about the topics I’ve chosen. Otherwise, I would’ve probably quit blogging a long time ago. It’s taken me over a year to finally start seeing this blog grow, don’t make the same mistake that I made. The great thing about the Internet marketing niche is..
People are usually willing to spend money because they want to make money. That being said, there are also tons of scam products that you need to avoid. Now let’s take a look at some niche website examples to help you understand what it takes to earn a living online. https://makeawebsitehub.com – A website dedicated to helping people get started building a website or blog so they can fund their own lifestyle. https://createandgo.co/ – Helping new entrepreneurs learn the ropes of starting their own blog and turning it into a successful business. There are literally an endless amount of affiliate products you can promote in the Internet marketing niche. I’ve taken the liberty of providing you some direct links to some programs you can promote. ShareASale – Affiliate network with tons of Internet marketing niches you can promote. Awin – This program has a popular Etsy program that bloggers love. Ultimate Bundles – This program is so popular in the blogging community and as an affiliate, you earn 40% per sale. Click Funnel – Sales funnel marketing tool. Grammarly – Online grammar checker. These are just a few of the Internet marketing affiliate programs and networks to help you get started. Should You Start A Blog In This Niche? As I’ve mentioned, this can be an extremely lucrative niche. That being said, there is tons of competition, so it’s going to take you a lot longer to see results. I’ve seen people start blogs in other niches and have quicker results than I have in this niche. I’ve also started a second blog in a totally different niche and I am already seeing results from it a lot quicker than this blog. If you do start a blog on this topic, make sure that you have the patience to wait it out. Results don’t happen overnight but once they do start happening, you’ll be happy you’ve put in all the work. This niche is different than the Internet marketing niche we’ve just discussed, but it can have some crossover. This audience may not be interested in making money online but may be interested in things like stocks, forex, real estate strategies, retirement and etc. FlexOffers – Tons of different wealth products and financial products to choose from. Now let’s take a look at some website that is doing it right to help you understand what it takes. https://www.nerdwallet.com/ – A review site of financial products that cover credit cards, mortgages, investing and insurance. https://20somethingfinance.com/ – Shares his story of how he went from zero savings and significant debt after graduating to saving over 85% of his income. When I was doing some research for a second site, I’ve noticed tons of affiliate websites in this niche. I’ve also seen some blogs do very well in this niche. I”ve personally thought about starting a small website in this niche, and who knows maybe with all the free time that I have I will. Now let’s take a look at some affiliate programs that you can join to help you monetize your website/blog if you enter this market. Most of the blogs that I’ve seen in this niche monetize their websites heavily with Amazon. Once you get into this niche, there’s a great possibility that you’ll find other profitable programs you can join. One of the most challenging things that I struggled with I first started my affiliate marketing journey was trying to understand how to set up my site and what type of content to write. That’s why I’ve found some great sites for you to model after. This doesn’t mean that you want to copy what they are doing, but these sites will help you see how others are making money in this niche. https://graywolfsurvival.com/ – a former counterintelligence, Special Agent, US Army Chief Warrant Officer, and Combat Veteran shares his experience and knowledge in this niche. https://preparednessmama.com/ – this blog provides life tips and guides for prepping. Now that we’ve taken a look at some of the most profitable affiliate markets, it’s important to choose an angle for your website/blog. An angle is nothing more than how you’re going to write content and approach your website. It’s hard as a new blogger to understand that we can’t help everyone. You’ll do a lot better when you can angle your writing to help a specific audience. This will also determine the type of content you publish. Articles that show people how to do stuff, for example, step by step guides or how to articles. Is your site going to be full of lessons? Are you going to turn it into a blog? Are you going to allow comments on your blog? Do you want people to get to know you or are you going to blog anonymously? What will the ton of your voice be? Depending on your audience, you can determine the type of content you want to publish. The great thing is that you don’t have to decide everything before you publish your first blog post. As your blog continues to grow, you’ll find yourself adding new content types and adding and removing ideas according to what your audience likes or doesn’t like. This just basically means why would someone choose your blog/website over your competitors? I personally don’t think that this is as important for a tightly niched website, as it is for an authority site. If you’re trying to build your brand and have an authority site, you need to find out what makes you stand out from the herd. What makes your site different from all the other sites in your niche? Why would someone share your content, link to your content rather than your competitors? What makes your site trustworthy? More in-depth content than your competitors. You’ve added more personality to your site than anyone else in your niche. Your site is easy to navigate and your readers can find the content they need quickly. You’ve written tons of how to’s and step-by-step guides that actually help your audience. You keep your site updated on a regular basis more than other blogs. You respond to people’s comments quickly within 24 hours. As I mentioned, this isn’t a huge thing to consider if you’re building niche websites. However, if you do decide to turn your blog into an authority site, you will want to take this into consideration. There are so many different websites/blogs online, you’ll have a much better chance of succeeding if you know what your value proposition is. It’s hard to believe that if you start a blog today, it could literally change your life in a few years. I’ve given you some examples of some websites in various affiliate markets online. One thing you will notice is that all the blogs are older than a year old, some are several years old. This should tell you that you can’t expect to start an affiliate site today and start making money tomorrow. It takes work to create a successful website, but it’s not like you’re doing hard manual labor. All you need is the right niche and 30-40 blog optimized blog posts and you should start seeing some results. The only reason that people fail is that they throw up a blog and expect to see overnight results. When they don’t see results right away, they give up. Affiliate marketing isn’t for the faint of heart. You have to be willing to treat it like a real business and with time and hard work, you will eventually start to see your hard work pay off. Affiliate marketing can be such a profitable business, especially, when you choose the right niche. There are literally tons of different topics you can blog about and most of them will allow you to earn money from home. The most important thing to remember when choosing a niche is that success doesn’t happen overnight. If you’ve never had a blog before, there’s a good possibility that it will take you longer to overcome the learning curve that comes with blogging. You’ll also need to give yourself time to learn how to write articles that sell. Regardless of how long it takes you, imagine where you’ll be a year from now if you get started building your digital assets empire today. Have you started your blog yet? If not, what is holding you back from creating the freedom you desire? Let me know in the comments below, I’d love to hear about your online journey. Hey, Susan Velez firstly thanks for giving the amazing description to define a proper niche for the affiliate marketing. I personally think if you want to succeed in blogging you should keep patience. No one gets to achieve instantly, fortunately, someone may be a success but it rare. So proper selection and hard work must be needed. Once again thanks for sharing the post. It definitely takes a lot of hard work and patience to see success. You’re right, there is no such thing as overnight success. Thanks for taking the time to stop by and good luck with your blog. Thanks for sharing these affiliate marketing resources. I’m doing great and hope you are too. I used to have a blog about the dog training niche as well. I remember those PLR days, I think I may have bought a few packs myself in various niches. A great article and list of best working niches to start a blog today. I think beauty and fashion, travel, and technology also deserve to be on the list as they can be profitable and most people would have interests in these. Thanks for a great share though. Those would be some good niches although, I think the technology niche could be a little hard. Things change too fast in the technology niche and it would be challenging to write evergreen content. Thanks for taking the time to share those with us. Hey Buddy!, I found this information for you: "6 Affiliate Marketing Niches You Need to Consider". Here is the website link: https://susanvelez.com/affiliate-marketing-niches/. Thank you.